Phuket (Thailand) – August 7, 2018 (travelindex.com) – The Phuket Yacht Show is set to become the definitive luxury yachting and lifestyle event when it welcomes thousands of visitors from around the world to the award-winning Royal Phuket Marina from 4 – 7 January, 2019. Lead by Show Director Andy Dowden and financially backed by experienced boat show operators from Turkey, Phuket Yacht Show organisers are promising to deliver the best yacht show ever seen in Phuket. 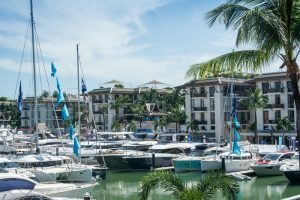 “I’ve owned and operated boat shows in Phuket for 16 years and in my experience, combined with feedback from key stakeholders in Thailand’s marine industry, Royal Phuket Marina is the ideal host venue due to its central strategic location and boardwalk facilities. And early January is the ideal time as that is when the highest number of globe-trotting millionaires and billionaires are on the island,” said Dowden. The Phuket Yacht Show will enable nautical lifestyle seekers a unique opportunity to view some of the world’s most iconic brands in Thailand’s premier waterfront environment and will showcase not only yachts, superyachts and marine related toys and services, but also high-end properties, fashion and accessories, super cars, fine dining and luxury products. Upto 120 exhibitors will be resident in the 2,500 sqm marina-side exhibition hall while in-the-water there is space for more than 50 yachts upto 35 metres in length. Accommodating the growing interest in superyacht sales and charter, a unique private island superyacht display will be located just five minutes from Royal Phuket Marina and accessed by private shuttle for qualified guests. Having convinced the Prime Minister of Thailand in 2003 to remove import and excise taxes on boats in his drive to make Phuket the yachting playground in Asia, Gulu Lalvani built the multi award-winning Royal Phuket Marina and has, since its opening, been host to the island’s best boat shows. “In addition to the largest and most diverse display of yachts and marine products ever, the lifestyle element of the show will be bigger than ever before. We have a number of events planned that will be part of the show including wine tastings, fashion shows, super car parades and much more. Our aim is to make Phuket Yacht Show the ultimate four day celebration of luxury and lifestyle on Phuket,” added Dowden. The Phuket Yacht Show will be held 4 – 7 January, 2019 at Royal Phuket Marina during Phuket’s peak season when the island welcomes the largest number of international visitors, HNWIs and Ultra High Net Worth Individuals.